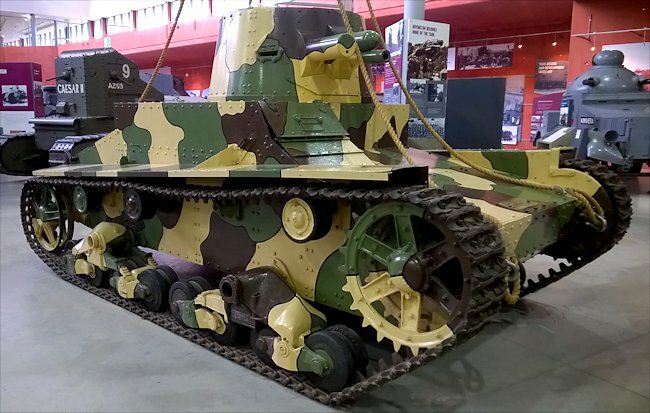 This British Vickers-Armstrong Mark E tank, can be found at the Tank Museum, Bovington, Dorset, England. It was sold to Russia and formed the basis on many of their early tanks like the T26. The Vickers Armstrong Mark E tank was produce in 1928. The British army took one look at it and rejected it for operational use. They did not like it because it did not fit their idea of what an infantry support tank should look like. It was one of the most stupid decisions they could have made because it was very advanced for its time. It was produced by Vickers in the inter-war years for export only and sold very well especially with the Russian army who purchased the license to produce them locally. Many of their early tanks were based upon this design like the T26. This is why I have included this tank in the Soviet tank section of my website. Some had two turrets side by side each with a machine gun in an armoured sleeve. Others had a single turret armed with a 47mm cannon. What was very revolutionary at the time was the use of slopped armour on the front hull which provided additional protection from incoming shells at very little additional weight. Shells found it difficult to penetrate these angled armoured plates and many would bounce off. If they did penetrate the amount of armour plating the round had to go through was increased because of angle of the protective armour. These design features would be incorporated in many of the future Russian tank designs like the T34 and IS range of tanks. The Germans and British for the early part of the war designed their tanks with vertical armour. When the enemy introduced a more powerful anti-tank gun to the battlefield all they did was add more armour plating which increased the weight of the tank and made it less manoeuvrable. It is interesting to speculate what WW2 British tanks would have looked like if they had used this tank in the 1930's. It was powered by an air cooled Armstrong Siddeley engine. It was exactly half the power that was used in the Vickers medium tank. It was rated at 80 horsepower and was in the back of the tank and lying on its side. It drove the power up to the front which was very odd in a British tank. You will notice that the large front track wheel has sprockets on it to transfer the power onto the track. The suspension was rather complex. It consisted of a large suspension bogie of four double road wheels suspended on a tube that ran across the floor of the tank. The bogie had leaf springs so the wheels could move independently of the others. Each side had two bogies. It made a good cross country suspension system but this was one of the features the British Army did not like. It was sold around the world and was very popular and relatively cheap. The example in the Bovington Tank Museum was built for the Thai Government with a modified hull to enable the turret to be moved over more to the right to give more space inside. When war broke out some, like this example, were still in the British Factory. The Army seized them and painted them green and used them for tank driver training. It required a crew of four: Commander, Gunner, loader and driver. Why did the British Army Reject this tank? The Vickers Armstrong six tonner light tank was a commercial design (as would have been the Valentine had WW2 not gotten in the way) and it was not in keeping with the British Army specified requirements for a future tank design. The British General Staff for all it failures had hit on the best layout for crews in a tank in the late 1920s. This was the three man turret with enough room for a commander, gunner and loader. This layout was copied by the German Army tank designers on the Panzer III and above. A German spy, a British Army officer, was caught trying to photograph the interior of a British Medium Mk III tank during the Mechanised Force exercises of the early 1930s. The Vickers Armstrong single turreted six ton tank failed to met the requirements and was rejected. The same applied to the Valentine Tank (and one of the reasons it was so popular with the Soviets: it fitted their tank doctrine). Perhaps if Mr Carden had been alive a turret of the A10 (with improvements in armour) could have been grafted onto the revised Valentine hull making it compatible with a General Staff G.S. Specification. The British trailed an Czechoslovakian built Lt vs 38 (panzer 39(t) ) in late 1938 early 1939 and rejected it as the turret was 'incompatible with the requirement of the General Staff' also rejected the Hotchkiss H35-38 no doubt for the same reason.